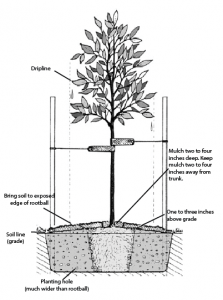 To ensure successful tree establishment, the following planting techniques and methods should be used. The best time to plant most trees is spring or fall; however, many containerized trees can be planted any time if handled properly. Plants installed during the growing season are susceptible to high transpiration rates leading to drying of plant tissues. • Early fall – best time for container-grown and balled & burlapped (B&B) trees. • Mid-February through early April – bare-root. Avoiding unnecessary damage and stress to trees prior to planting will insure better success. • Keep the rootball moist. • Handle the tree by the container, not by the trunk. Preparing the planting area properly before planting is very important. • Do not apply amendments to backfill. • Dig the planting hole two to three times the diameter of the tree’s rootball and no deeper than the rootball itself. 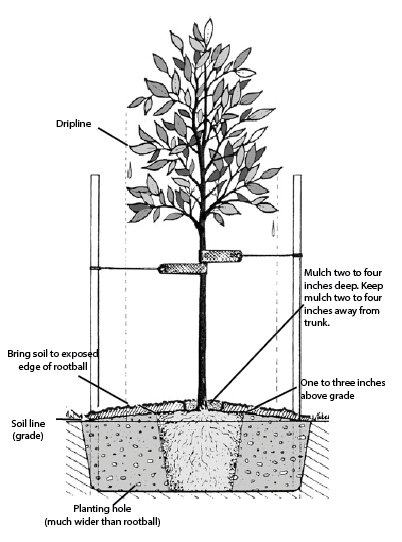 • Since most Oklahoma soils are clay, plant trees one to three inches above grade. Plant trees at original grade in sandy soil. • Do not put crushed stone or gravel in the bottom of the hole! • Remove the bag, container, and all strings and wires from the trunk! The burlap of B&B trees may be left on to decay. Be sure to lay burlap back away from trunk and cover with soil. • If roots are excessive and circling inner walls of the pot, score the outer edge of the rootball by slightly severing or scratching the root system. Do not cut deeply into the rootball. Fill in the planting hole (backfill) with native soil and tamp lightly. Soil amendments are not necessary and may result in further complications such as root rot. A new tree has a very limited capacity for utilizing fertilizer until it becomes established. Heavy fertilization is not recommended at the time of planting. Excessive fertilizer in the root zone can be damaging. If fertilizer must be used at planting or in the first growing season, apply a controlled-release or liquid fertilizer at the lowest labeled rate. Newly planted trees should be watered well at the time of planting and during establishment. Natural rainfall is usually not adequate to provide the moisture needs of newly planted landscape trees. Generally, young plantings need an equivalent of one inch of rain per week. Newly planted trees may need to be watered two or three times a week in extremely hot, dry, windy weather because their root systems cannot take up the amount of water needed to replenish the water lost through the leaves. Watch for signs of wilting as an indicator that the tree needs water. Apply water slowly at the base of newly planted trees. This is especially important for container grown plants as soilless mixes can dry while the bed or surrounding soil remains damp. If you have several young trees and shrubs, a drip irrigation system would be wise. Be cautious not to overwater or the amount of oxygen in the soil will be lowered to a level that will damage roots. Make certain the timing and patterns of lawn watering systems are not overlapping into plant beds and too much water is being applied. • Create a weed and turf-free area. • Reduced plant competition for water and nutrients. • Regulate soil temperature and moisture. Avoid overpruning new trees. Leave the lower limbs intact if possible. Remove injured or diseased branches only. Overpruning may result in sunscald and inhibit tree growth. Protective wraps provide physical protection against lawn mower and weed-eater damage. Protective wraps also provide protection by regulating temperatures and bark moisture for thin-barked trees such as ash, birch, linden, and maple. If misused, however, damage may occur from trunk girdling or constriction, insects, diseases and excessive moisture. • Protective wraps may not be necessary at planting time. Use wraps based on type of protection needed. • Normal application of tree trunk wraps is October – March for the first two growing seasons. • Remove wraps each spring prior to spring growth. • Wrap loosely from the base of the tree up to the first branch by overlapping for shingle effect. • Plastic guards should fit loosely and include holes or slits. • Inspect for damage and insects and spray for borers when necessary. Stake young trees sparingly and briefly when possible. In fact, prolonged staking can have detrimental effects on the development of the tree. Too often, staking materials end up injuring or girdling the tree. Stake trees when top-heavy or planted in windswept areas. The material used to attach the tree to the stake should be broad, smooth and somewhat elastic. Do not stake the tree too rigidly. Always allow for sway. Tight or prolonged staking results in an overall weaker tree that is more subject to girdling. Triple staking provides more protection against strong wind and lawn mowers. Support stakes and guy wires generally should be removed after one growing season. If staking is left in place for more that two years the tree’s ability to stand alone may be reduced, and the chances of girdling injury are increased. Though all the trees listed below will grow in Oklahoma, be sure to visit a local nursery/garden center or County Extension Office for proper selection of species best suited for your area. It is important to note that the lists below are not comprehensive, but merely a sample of what can be successfully grown in Oklahoma.